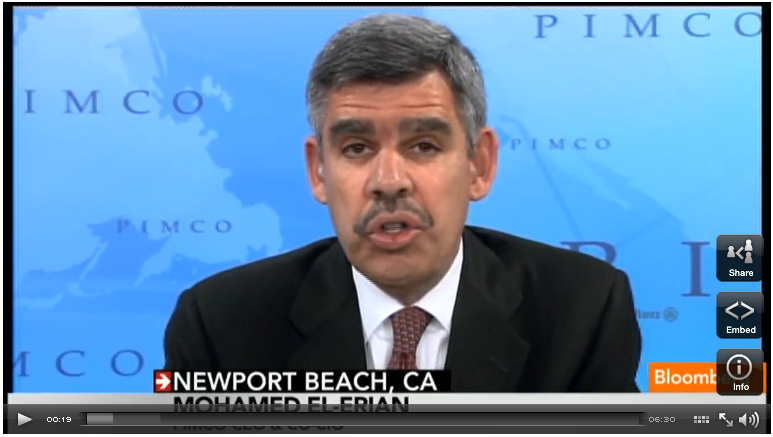 PIMCO’s Mohamed El-Erian sees a lot to like in the March jobs report, but says a number of concerns remain for the economy. El-Erian tells Bloomberg that in addition to a good headline jobs-added number, the March data showed the participant rate going up and structural issues, like long-term unemployment, improving. But, he adds, we are not yet at “escape velocity” — where the labor market and consumers can push things forward. He says the European economic troubles continue to be a big headwind, as do structural issues and fiscal policy in the U.S. economy. El-Erian adds that the recent rally in equities has been warranted because of short-term factors, but adds that more permanent factors now need to kick in for the rally to be sustained. He says it will be key for investors to target firms with strong balance sheets, an ability to return money to shareholders, and exposure to high-growth areas.